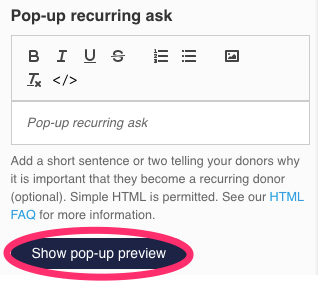 Our pop-up recurring feature allows you to ask donors to make their one-time donation a recurring one after they’ve hit “Contribute." Their one-time contribution will already have been recorded, so you won't lose out on any donations. 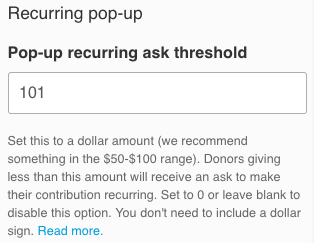 It’s an easy and fast way to begin building a recurring contribution program, so the pop-up recurring ask is turned on by default for all contribution forms (but donors always have the option to skip making a recurring donation). The default threshold is $101: any donor who gives $100 or less will be asked to make their donation recurring. To edit or disable this feature, locate your contribution form under the Contribution Forms tab of your Dashboard. 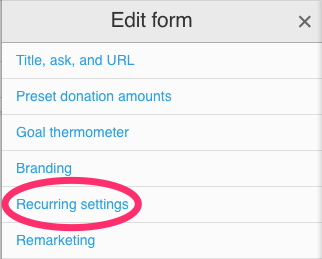 Click on the “Edit” button to open the contribution form editor and open the “Recurring settings” tab in the menu. This will allow you to see the pop-up recurring options. 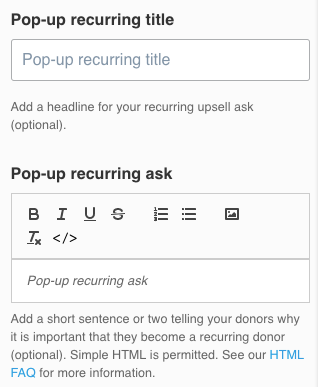 Here you can enter a custom amount into the "Pop-up recurring ask threshold" box. Supporters who give a one-time donation smaller than this amount will see a pop-up box on their screen asking them to make their contribution recurring. You probably don't want to ask a $1,000 donor to make their donation a recurring donation. But you might want to ask a $5 or $25 donor to convert to a monthly recurring gift. If you want to turn the pop-up ask off for everyone, enter “0” in the threshold box. The “Pop-up recurring title” is an opportunity to add a short, catchy headline to your pop-up recurring ask, and the "Pop-up recurring ask" is custom text that will appear on the pop-up. Try to remind your donors why a continued investment in your campaign or organization is important to your long-term goals. You’ll want to keep this blurb as short as possible, to make sure it’s not overwhelming for your mobile donors. Once you’ve configured your pop-up settings, don't forget to click the "Publish changes" button to save your changes. Then click on “Show pop-up preview” at the bottom of the “Recurring settings” tab to see what your pop-up ask will look like. When a supporter presses the “Donate” button on a contribution form, we’ll initiate a charge for the one-time donation. If they choose to "Make it monthly" on the pop-up, we convert their donation to monthly recurring. Supporters always have the option to skip the monthly donation. If they hit skip or do nothing (close the page, etc.) the donor will only see the one charge they initiated on their credit card statement. You can also customize your pop-up recurring box, which we highly recommend. By inserting an image or some customized HTML, you can prompt your donors by showing them something that will make them excited to become a recurring donor. Customizing a pop-up box has tested well for a number of organizations, and we encourage you to try testing some customizations on your own forms. Once you’ve finished customizing your pop-up, make sure to click on the orange “Publish changes” button at the bottom of the form editor to save your edits. If a donor initiates a recurring contribution from your pop-up ask, you’ll see a column indicating that in your CSV reports. This should allow you to keep track of how successful your blurbs are and can help your team plan for further testing. Over the course of a fundraising program, utilizing the pop-up recurring feature can build a large base of recurring donations.